It’s Week in the Life (read more about it here) and I am full on documenting my life. I notice how fun it is, but also how beautiful my life is. How much I get out of each day: sounds, smells, impressions, communicating, creating, walking, eating, interacting, sharing, documenting, reading, watching, living. This blog, while taking up a lot of time, is a big part of helping me feel good about my life. Writing and sharing stuff I see and make helps me notice them better, while also providing me with time to reflect on and create ways to remember them by. I love that! I have been doing this for 8 years (! ), so this week it’s Blogoversary week! We’re celebrating with a giveaway of washi tape (your choice in the sponsor shop). I’ve written about washi tape before, but today I thought I’d share my latest washi tape ideas! 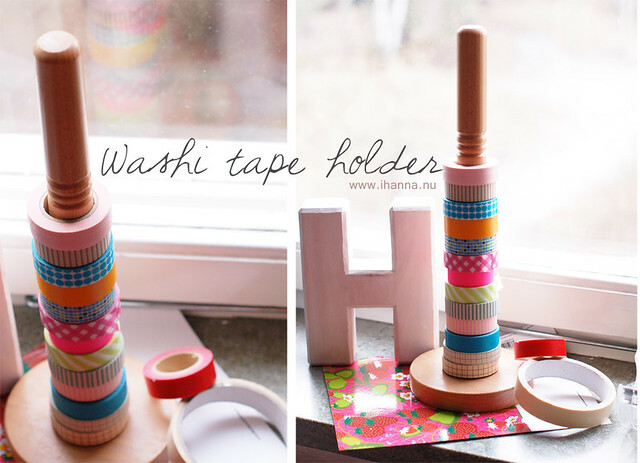 The first one is a washi tape holder idea. I’m using a holder intended for keeping paper towels (also called kitchen roll/paper) on the table. Simple storage idea, but I think it looks so nice with all those tape rolls! It’s easy to remove tape from it, view what colours and patterns I’ve got and to take out a roll when I need it elsewhere. I might spray paint the holder this summer, when I can do it outside. The second one is totally inspired by Daisy Yellow’s teeny tiny container! From all the inspiration I view daily online I love it when finally I see something (often small and quick) that spark something in me. It’s the Irresistible Inspiration at work. It’s when you can’t wait, you just have to do it, and then you actually do it. I loved the teeny tiny container idea, and because I had a tin container close by and a need for a decorated one I finished it at once. I’m going to keep leftover embroidery floss in it, because if I put it in with the other embroidery things its either lost or tangled. And speaking of the blog Daisy Yellow… the winner’s of her zine in my birthday giveaway have been drawn with the help of random number generator. The winners are comment #5 by Christine, #86 by Marcia and #58 by Suzanne. Congratulations girls, Tammy will send you each a copy of issue 4 of her e-zine! Winner in my birthday giveaway #2 is Moira! Congrats, I hope we can see some embroidery experimenting from you this year! You will get a copy of the pretty embroidery e-zine &Stitches (issue #2) from Carina. If you didn’t win you can still enter the Cute Tape giveaway! Also, the stART e-zine and the &Stitches e-zine are awesome and you should get yourself a copy of each issue even if you didn’t win this time. Oodles of inspiration in each one! This entry was posted in Pretty things and tagged tape, tin can, washi tape, week in the life, zines. Bookmark the permalink. Yay! I’m excited to try out some new embroidery ideas — I have tons of embroidery thread already. Thanks! Marvelous week, Hanna ! Aren’t you amazed by how many sweet things there are to notice once you start looking for them ? Here’s to small graces everywhere ! Happy anniversary, i love your blog, dont always comment but always read it. I love the tape holder, and am going to use that idea for sure, loving the small tin with the tape, i have just the right tin for it. Thanks for being so inspriational. Lee, thank you for your kind words! It’s great to know you read and find inspiration here, even though you might not always comment, thanks for letting me know! I have succumbed!! inspired by your washi tape blog i have just ordered my first batch! exciting! thanks so much! I seem to have good luck lately, let’s hope that it keeps going on! you are a great inspiration Hanna!! 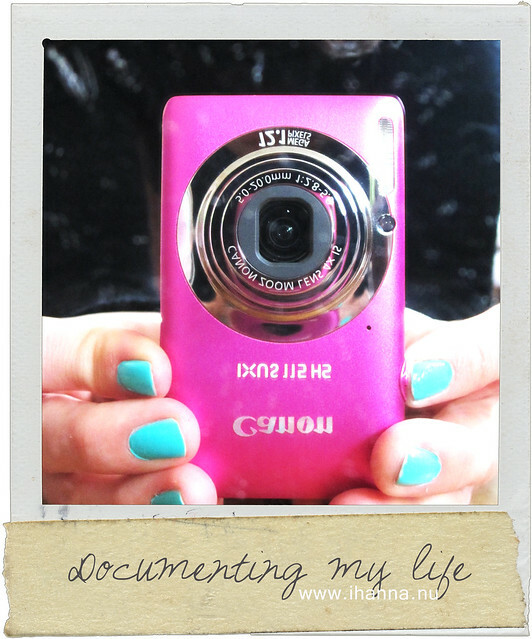 love the pink camera turquoise nail pic….so wonderful!! 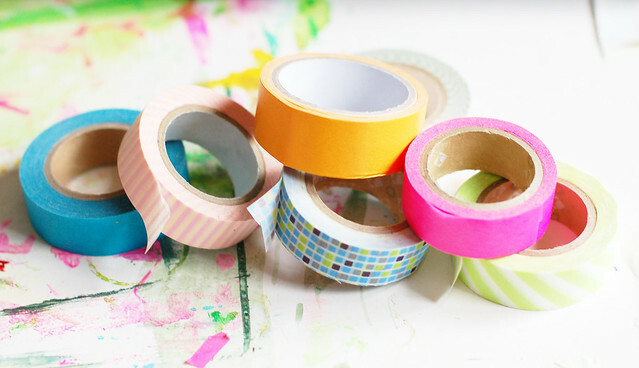 Just getting hooked on Washi tape — LOVE it and now I’ll be wanting it ALL! Guess I’ll be needing a couple paper towel holders soon?!!! Assume I missed your giveaway, but glad I found your blog!! !